Whereas, the list of educational institutions not lower in standard than that of a secondary school has been notified vide G.O.Ms.No.537, General Administration (Elecs.F) Department, dated 28.09.2006 and G.O.Ms.No.644, General Admn. (Elecs.F) Dept., dt.09.11.2006 by the united Andhra Pradesh State with the concurrence of the Election Commission of India under clause (b) of sub-section (3) of Section 27 of the Representation of People Act, 1950. All Arts, Science, Commerce, Professional and Technological Colleges affiliated to all Universities in Telangana established under the Acts of the Central or State Government (Ex.NALSAR, ISB.,IIIT, NIFT etc.) and all University Colleges maintained by the above Universities. 3. 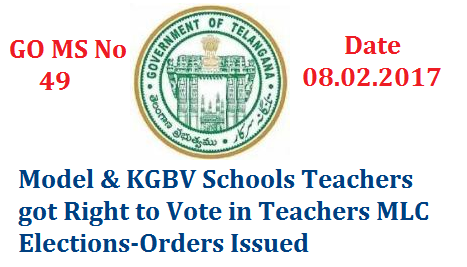 All High Schools recognized by the Government of Telangana under the code of Regulations for Anglo-Indian Schools.